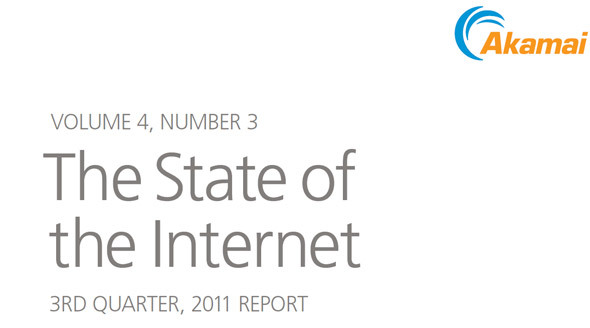 Akamai’s quarterly State of the Internet report always makes for good reading material regardless if you’re in the internet business or not, and this month’s release – the report for Q3 of 2011 – is a treasure trove of interesting facts. Boston Consulting Group has projected that the global internet economy will double to nearly US$4.2 trillion by 2016 which is good news for the current generation of internet entrepreneurs, and businesses who are looking to expand with the help of the internet. However before you venture out into the World Wide Web, one startling figure which you should take into account is that the number of DDoS attacks has increased 2000% over the past three years. Food for thought? We definitely think so, since it is widely reported (by multiple sources, not Akamai) that enterprises tend to cut down as much as they can when allocating budgets to the IT divisions in their corporations. More interestingly though, Akamai reports that nearly half of these attacks are coming from the Asia-Pacific region, with Indonesia being identified as the largest source with 14% of all observed attack traffic. Taiwan and China come in second and third, but account for less than 20% of attack traffic combined. DDoS reports aside, the SotI report also talks a fair bit about internet connection speeds around the world, and surprise surprise, South Korea sits on top of the list with an average connection speed of 16.7Mbps. That is six times the global average connection speed (2.7Mbps), and a healthy bit higher than the Malaysian average which is reported to be 1.9Mbps. For more interesting facts that were gathered on the Akamai network, head on over to the Akamai website to check out the full Akamai State of the Internet report for yourself.